Four shiny new cellar tanks enchere recently added to our cellar room here at the brewery. We caught up with cellarman Ryan Akers, who shared a few details about the new tanks and how they will be used. Moving a new cellar tank into place. What will the new tanks be used for? 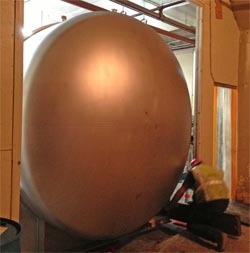 Ryan: The new cellar tanks will be used for beer maturation. More cellar tanks mean we can increase production across the board, from brewing to packaging. How many will be installed? 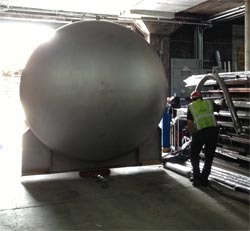 In the short term, we will be installing four tanks, two of which are in place. Eventually we plan to fill the empty cellar space with tanks, and then install even more tanks outside. Are they going to be used for something in particular, or just continuing to build out our capacity? Continuing to build our capacity. Is there anything interesting or unique about them? Any fun facts people wouldn’t otherwise know? Securing the tank in its new home. The tanks are made in St. Cloud, Minnesota. 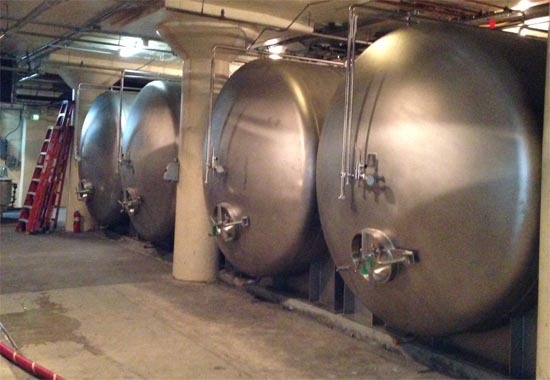 At 294 barrels apiece, these are the largest tanks we have in the cellar. We have other 290-barrel tanks, but none bigger. The new tanks weigh 9,500 pounds empty, and 88,000 pounds when they’re full of beer. That’s 44 tons. We move them into place by rolling them on temporary wheels, using winches, crowbars and elbow grease. 294 barrels comes out to 9,114 gallons or 1,458,240 fluid ounces, which is enough to fill 121,520 bottles – which would be enough for everyone of legal drinking age in St. Cloud, Minnesota to have a beer.